Still a favourite set of mine, if only because of the powerful force known as nostalgia! They don't stack-up next to the modern efforts of Pegasus, but there are so many out there they are useful for filling the ranks in large invasion forces! 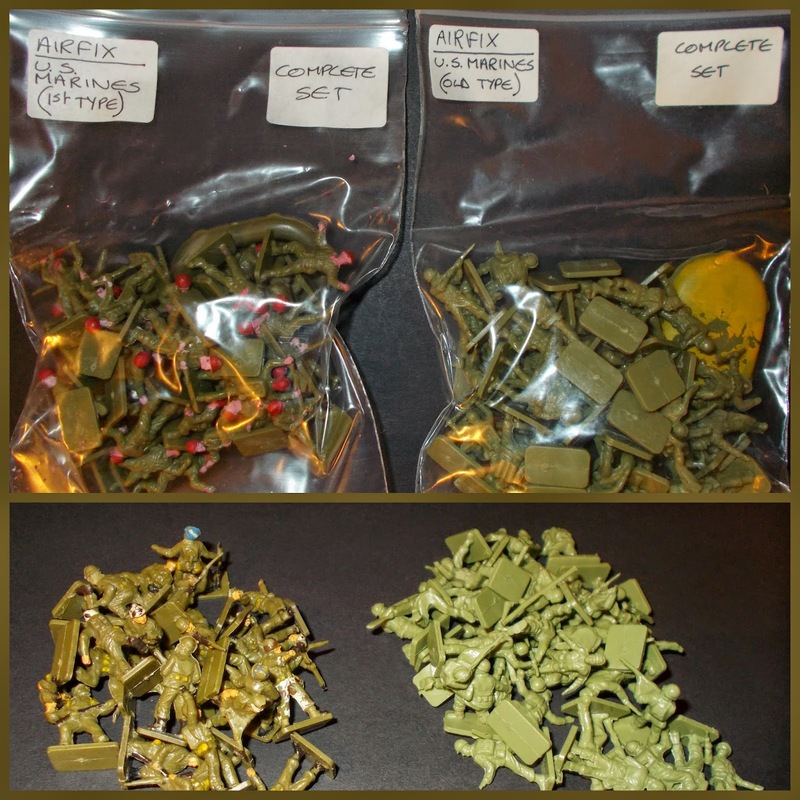 Airfix never produced a specific set of 'US Infantry' so these doubled-up in the European theatres of many a war gamer, the uniforms being pretty rudimentary - in the sculpting - meant there was little or no danger of rivet counters banging-on about leggings or bayonet sheaths"
A complete set; usually I try to photograph an unpainted set, but I rather like this batch, they came in with a large 1970's war games collection back at the turn of the century and I love the apple-green helmets and the fact that the two dead guys follow the Star Trek rule...those who are about to die; dress in red!....the fat lady in the civilian set has a similar rule! This is one of the easiest sets to sort without consulting PSR, ATF or Williamson (or these pages!) as it's a simple rule; two of each with boat and bazooka vignettes for a total of 46 pieces. 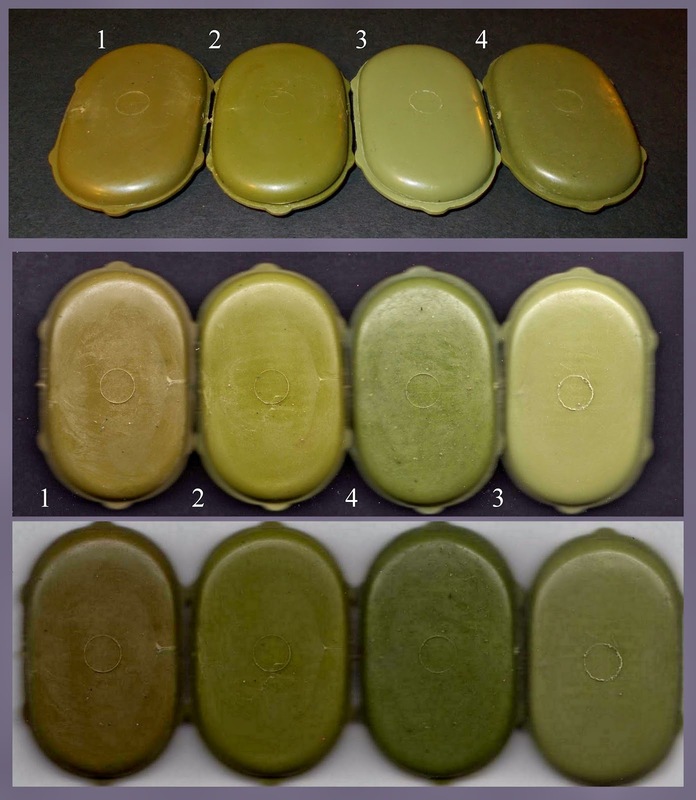 Colour variations, early sets come in various pallets of dark olive or olive green, later ones are in the paler herb greens or light-olive. When I get a set that is 'clean' but incomplete, the label on the right of the little self-seal bags reads "Incomplete 36 of 46" or something similar, and every few years I have a session with the spares bag, trying to colour match to complete the set. You loose a lot of the colour difference when you use flash, so I thought I'd try scanning this time...as you can see, the scans are completely different depending on the colour of the background...so that worked! The flash image (top) has the second two in a different order so I've numbered them. between the three pictures you get some idea of the colour range available. 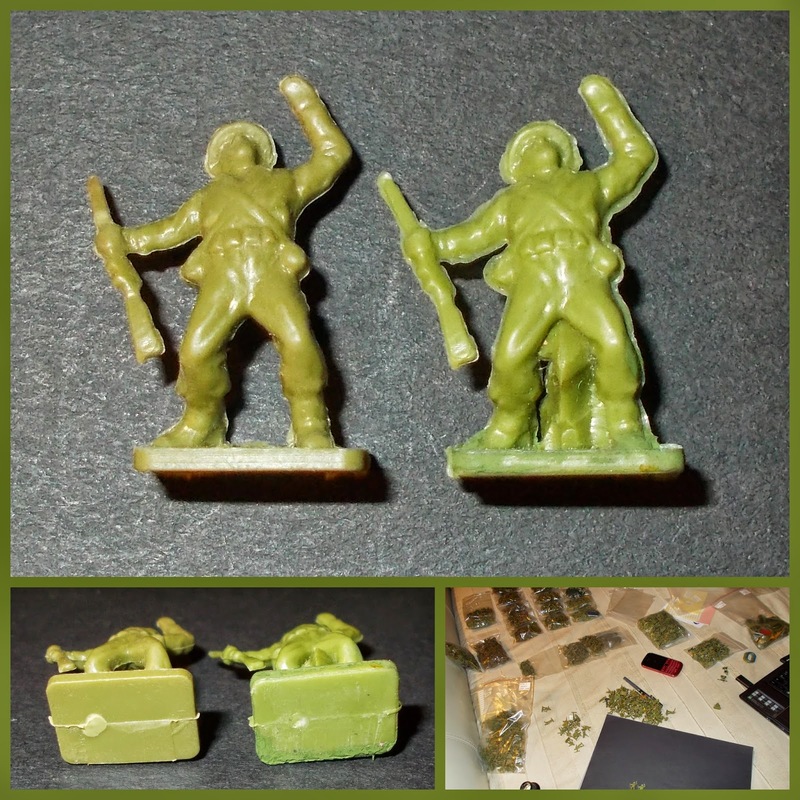 Due to it's age, this set has more variations in colour and shade that all others bar the Paratroopers and Infantry Combat Group, the 1st version Commandos coming a poor 4th! Early sets vary more, as they were still hand-dying the neutral granules at the point of production, later sets would have used pre-coloured granules, and there is better consistency, however, batches and variables like the operating heat still means that late sets (2nd type British Infantry for an example) do have variations, as do the later grey sets such as the Mountain Troops or German Para's. More scans...this time the ones to the left of the crawling pose are later paler colours (to the eye), the ones to the right are the darker, yet they meld into a complete mix under the scan light. The only way to get good colour matches is to sort on a bright sunlit day, on a desk facing a window but not in direct sunlight, and with two desk lamps facing across the desk from either side, both equipped with 'daylight' bulbs. The exercise makes you eyes hurt and can't be done by someone with colour blindness. To get a set as 'complete' as possible, you are trying to find figures that passed through the factory within hours or minutes of each other, 40 or 50 years ago! From a pile of figures with dozens of subtle colour differences. On the left an example of lovely sculpting given the limitations of the still (then) quite new technology. On the right a common problem with this set. As the plastic moves through the mould runners it is already cooling, it needs to cool in a few seconds, before the moulding is released, as a result where you have a large cavity (in relation to the other cavities in the same mould) there is a danger that the plastic will form an internal membrane where the two travelling blobs (slugs?) meet. In this case it coincides with a detail element as well, causing a weak-point to be created, which over time parts in play! Another bugger's efforts, I like that he's consulted the old Osprey (or was it a Military Modelling magazine article?) 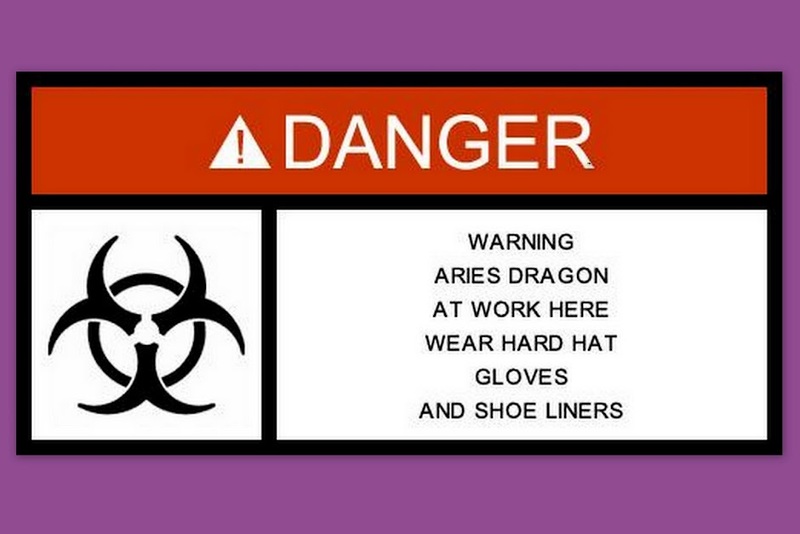 for helmet markings. 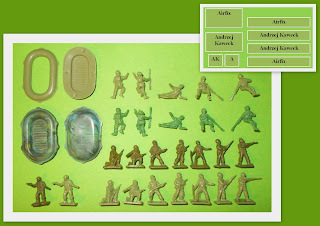 A simple scheme of boots, weapons, helmets and flesh; with the exception of the Napoleonics, allied ground crew sets (all the cream sets really!) 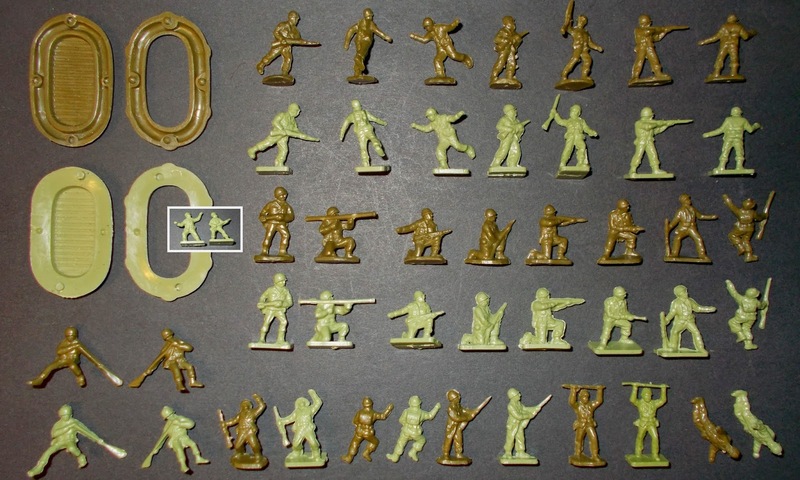 and the orange-brown 'neutral' sets, this was the intention behind Airfix's plastic colour system with these little figures. Another 'fault' figure, this is the only on I have among all the loose figures (spread-out on the bed for this photo-session), although I do have a memory of removing this little rock from between the legs of a couple of figures when I was painting a batch back in 1977! 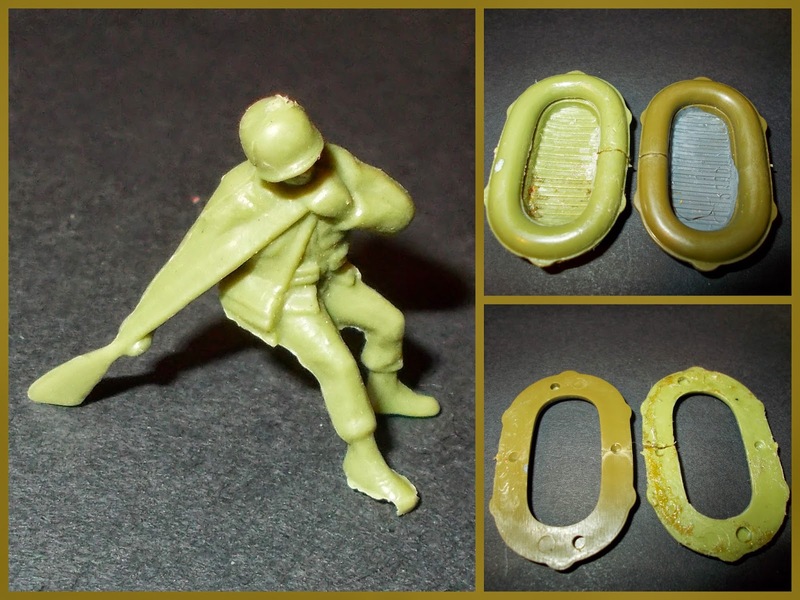 If you found this figure in a tin of mixed junk from a car-boot you'd easily think he was a HK pirate...bright green, flashy, lump of stuff...but he's Airfix all right. I'm not sure how it happened either, it looks to be a chunk of the mould missing, but if that was the case he'd turn-up more often, so I guess it might be extra-plastic (still molten) spilling (under pressure) from the mould as the two halves were parted? Yet the two I remember fixing had the same shape, which means it is a piece of missing mould, so they may just be the final production, showing the need for a new sculpt which followed soon after? 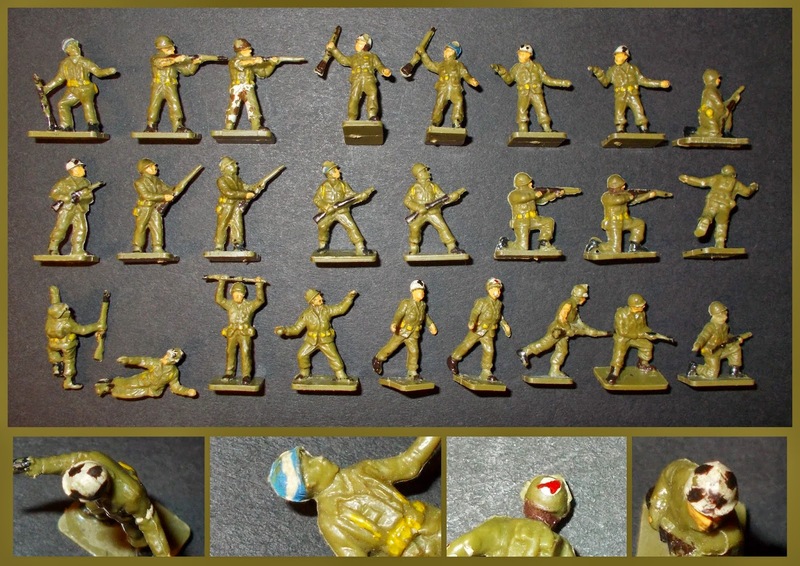 More OBE's, this time there is one of mine...the guy wading with his rifle above his head and the dun-coloured pack is the last of my original figures - the rest are around, but long-ago paint-stripped. He's not from the '77 batch (they never got finished! ), he's from about '74 (I was ten!). The officer, two to the left of mine is particularly well-painted, the gloss green ones have unit details painted on the bases and are from another war gamers army...recognise any as your work? Comparison with the set that replaced them, while all the poses in the new set had a match in the old set, the pose-count of the old set wasn't matched by the replacements (9 figures to the right). The new ones are immeasurably better sculpts though, and there's really nothing in the size. 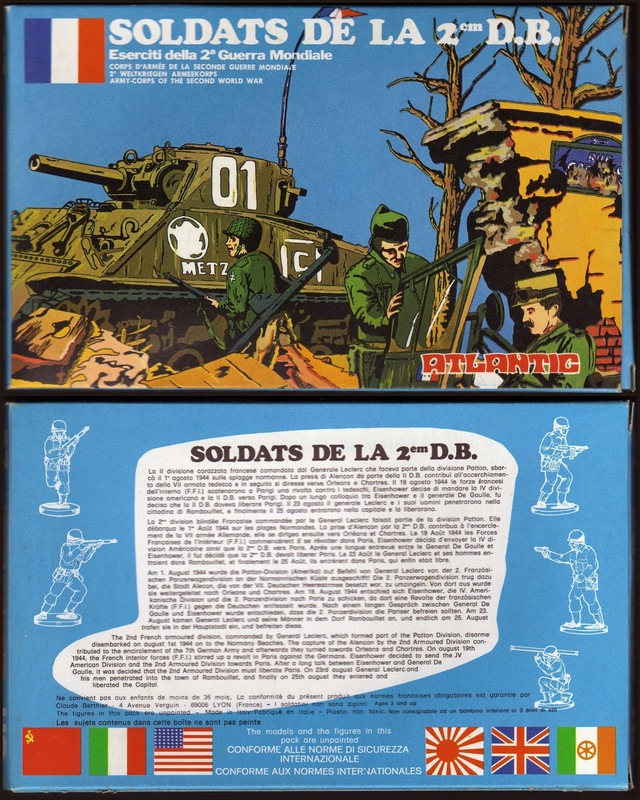 The bazooka-man in the new set didn't get a No.2, but as the loader in the old set had spent ten years trying to force a mortar-bomb of nearly twice the calibre into the back of the bazooka the new guy was probably better-off doing his own loading! The cause of the trouble. Matchbox only produced 7 sets, but they were a breath of fresh-air at the time. There had been no decent competition for Airfix since the start, and while Atlantic were around by 1977, they were hard to locate in the UK to start with, and the range was not that close to Airfix, apart from the Wild West range and there were scale-compatibility issues. 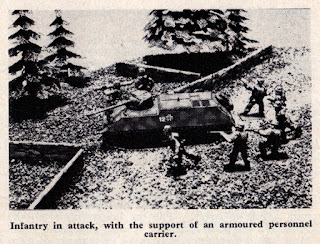 The Matchbox on the other hand went mano'a'mano against the sacred-cows of Airfix's WWII oeuvre in the same 1:76th scale. And won...hands-down against these! 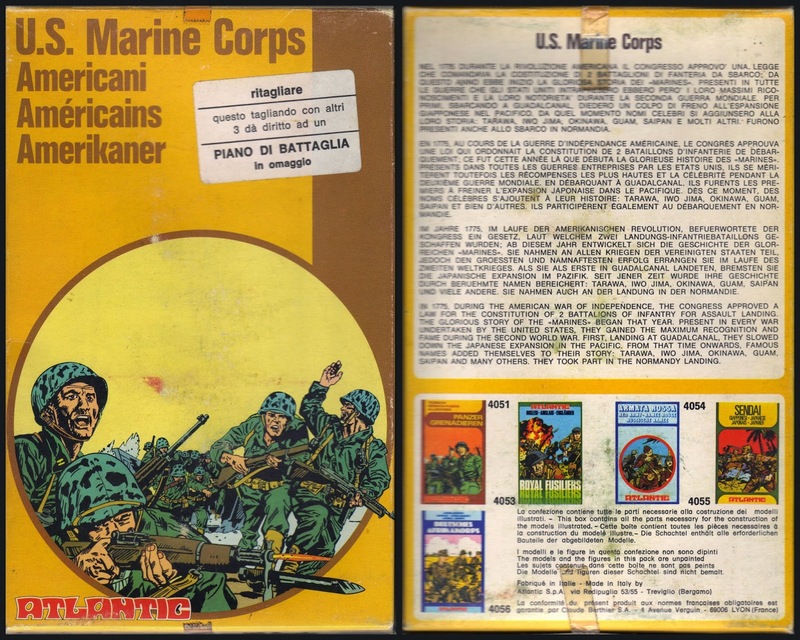 To illustrate the point above, lets look at the Atlantic offering...The box had exiting 'comic-book graphics which was an instant 'hook', and a comedy blurb on the back"...did they take part in D-Day? I always thought they were held for the pacific where they were developing a method for dealing with the Japanese that was very different to the slogging in Europe? 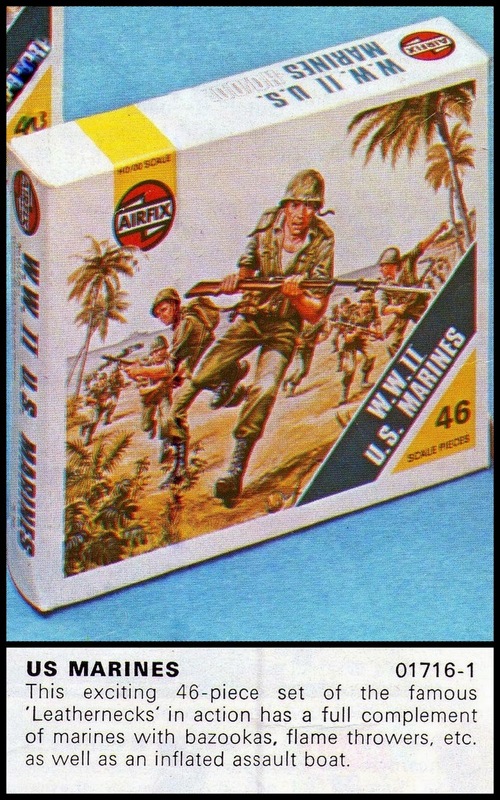 Blue-plastic figures are supposed to be the French, also from Atlantic, but they do appear mint in US Marine Corps boxes from time to time. 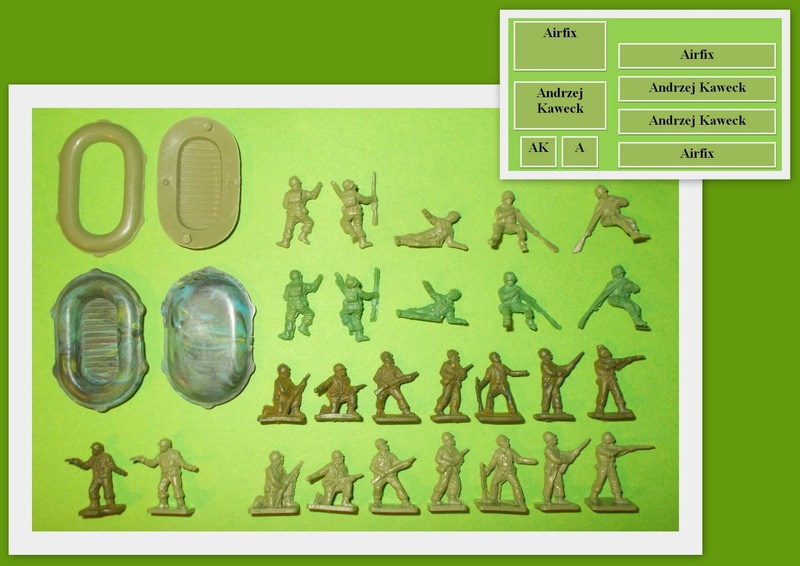 You can see the influence of the 2nd version Airfix figures in these, but given the timeings, they would have been based on the 1:32 scale poses of Airfix's US Infantry - as were most of the offereings we'll be looking at here (Fujimi, Esci, Hong Kong...). They - the Atlantics - are a bit bigger, but a lot of the mismatch is down to the huge bases. Floating - Just! Due to the two-part construction, it quickly fills with water, something that could be cured by 'glueing' with silicon-sealer...however, if the boat isn't full of water; water-tension pulls the paddlers out and they float-off face-down in the briny! 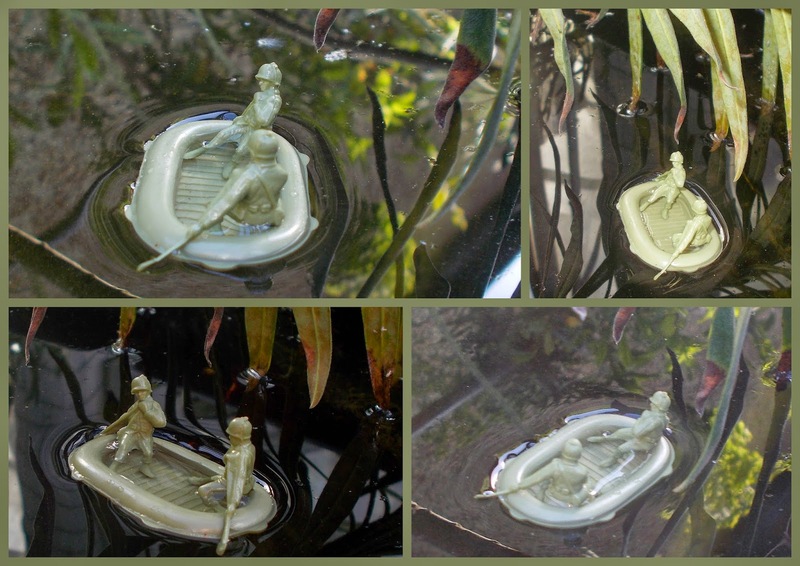 Having the water in the boat actually keeps the figures in situ long enough for a quick photo-shoot. 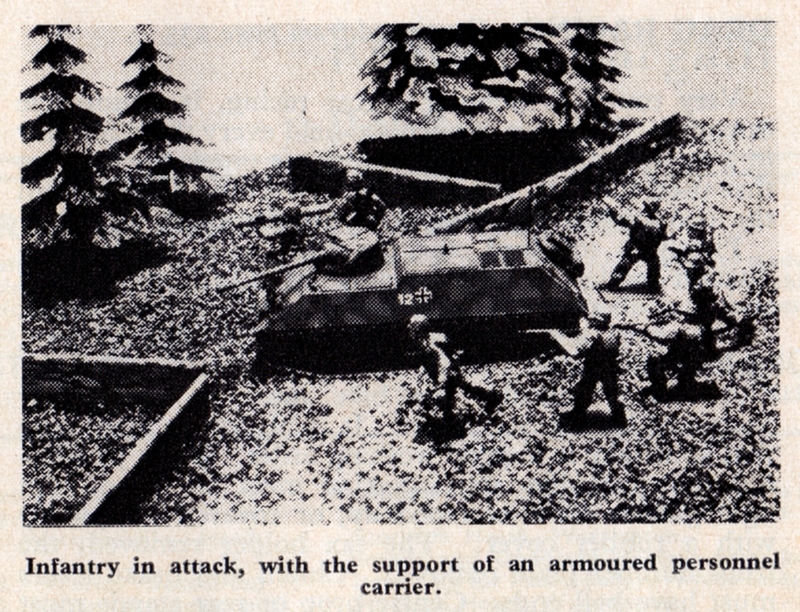 Meccano magazine from May 1969 has the chaps acting as Bundeswher troops with a Roco-minitanks AFV in the battle-taxi/fire-support role. Andrzej Kawecki's recycled PVC rubber, kiosk 'Miniatures' Set 2 US Marines compared to the Airfix set, there's a loss of size all round, but the level of copying vis-à-vis detail reproduced is not bad, and a rubber boat made of rubber is going to float a darn-sight better than the Airfix offering. Thanks to Konrad Lesiek for helping ID these.